Tomatoes, mozzarella and basil are one of those combinations that never gets old. In this take on the classic Italian salad, chicken breasts are cooked in an acidic sauce flavored with balsamic vinegar, white wine, and cherry tomatoes, then topped with melty mozzarella cheese. The tomatoes get a little bit blistered during cooking, so their juices mix. This dish is delicious on its own, but would also be excellent sandwiched between toasted crunchy bread like ciabatta. Just be sure to drizzle the bread and chicken with extra sauce to soak up all of the flavor! Julienne (or cut into long thin strips) the basil by placing a few leaves on top of each other, then roll up vertically, resulting in a tight cylinder of leaves. Using a very sharp knife, cut the cylinder into thin slices. Shake out basil with your fingers and sprinkle over chicken. Serve this over spaghetti tossed with olive oil and a glass of Cabernet on the side for a complete meal. Per Serving: 637 calories; 36g fat; 6.1g carbohydrates; 63g protein; 192mg cholesterol; 879mg sodium. One of the best combinations in the food world is tomatoes, mozarella, and fresh basil drizzled with balsamic vinegar. Add chicken to that mix and you have a star. I love the hot tomatoes with the melted cheese and how they present a new take on the classic cold dish. The amount of cheese was a bit much for me so I cut it back quite a bit by just thin slices over each breast. 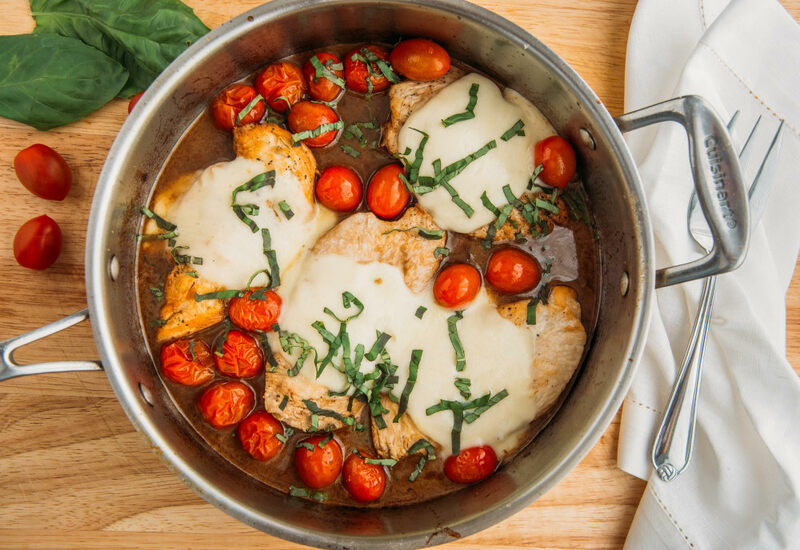 This is a classic chicken caprese recipe that was really easy to make! I loved the cheesy mozzarella on top, it was so good. I served it with pasta tossed in olive oil, it was wonderful. Tried this as a sandwich using ciabatta. So good, especially when you drizzle the bread and chicken with extra sauce (thanks for the tip). This is a great recipe for when you want to change up your routine chicken dish. I didn't have any basil, (I know, I know), but this recipe still turned out fantastic. I garnished it with parsley instead. Everyone loved it! The mozzarella cheese and sauce really won me over. Served this with whole wheat spaghetti and it was really good. This is a great recipe for the kids too. I just don’t garnish theirs with basil. Super easy with great flavor!